We've already made clear the blindingly obvious things we want to see Nintendo improve upon with regards to its next piece of home console hardware. Now let's make clear what we want from that piece of hardware's games. It's becoming increasingly likely that come E3 - or maybe even later this month - Nintendo will announce a successor to the popular Wii console, a system that's topped sales charts around the world since its release in 2006. Yet while the Wii sold well, its technological limitations have left the company stuck in 2005 in terms of graphics and game worlds while the rest of the industry has moved onto brighter, bigger things. Whatever shape or form the next Nintendo console takes, here are some examples of things we'd love to see Nintendo do with a new, powerful piece of hardware. Note that they're not specific things we're demanding. Or predicting. Nor will we try and guess the finer details that will be possible with any gimmicks or tricks or new control innovations Nintendo may introduce with the console. They're just ideas of the kinds of things we'd generally like to see done in terms of scale and depth and connectivity, and which hopefully get you thinking about what you'd like to from a new Nintendo system beyond things like 1080p and 5.1 sound! 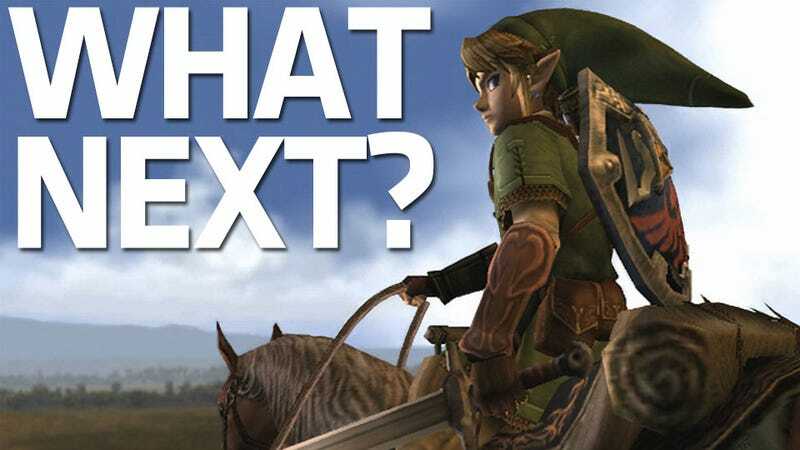 Ask a Nintendo fan which series would benefit most from a "next gen" update and they'll tell you it's Zelda. Once a flagship franchise for exploration and questing, the Zelda formula has grown, if not stale, then a little quaint in recent years while other titles go bigger and broader. While a HD Zelda would be easy on the eyes, it's in the design of the game that we'd like to see the increased horsepower be put to use. Stuff like increasing the size of Hyrule, make dungeons bleed in and out of the game world itself, populate the game with scores of NPCs and other incidental details, that sort of thing. Give us, basically, the little bits of Oblivion and Assassin's Creed the series could easily draw from while still staying true to its roots. Dependant on whether Nintendo figures out how to use the internet this time around or not, Animal Crossing could be a key title to exploit new hardware. The Wii edition, which was little more than a minor enhancement of the versions which had come before (which, in turn, was originally an N64 game), needs to be thrown out. If anyone at Nintendo has been paying attention to Facebook over the past three years, they'd know that an Animal Crossing MMO, complete with giant "city" overworld and deep multiplayer integration, could be the company's next great casual gaming revolution. If, that is, anyone at Nintendo figures out how to use the internet. Which is a big if. Scores of opponents, busy backgrounds, dazzling lighting effects, a pounding surround sound score and effects...if any series in Nintendo's stables could really revel in a new, improved piece of hardware, surely futuristic racer F-Zero would be it? It's been one of gaming's greatest teases over the past decade that, while Pokemon role-playing games have flourished on handheld systems, there's never been a true entry in the series on a home console. Why not use a new machine to buck that trend? It wouldn't need to be a graphical showcase, but if Nintendo did decide to get around to using the internet like a modern console, then it could be a whole new way to experience Pokemon battles. Imagine dropping-in on a battle against a random human opponent. Or, if Nintendo really catches on, downloading new Pokemon every month to add to the game as DLC, fresh from the oven. Again, though, those are big ifs. Another Nintendo series that could really benefit from an increase in horsepower. Take Pikmin as we know it, then imagine you can control thousands of the little guys at once, in a game that's able to scale effortlessly ala Katamari Damacy as you move from garden to park to forest. Of course, Shigeru Miyamoto says a Pikmin game has been in development for years now, and we've seen absolutely nothing of it. Maybe it was never meant for the Wii at all? And...that should about do us! Yes, we know, there's no mention of Mario or Metroid or Mario Kart or Smash Bros. Like we said, these aren't the actual games or series we want to see first on, just some examples to get you thinking.